Your gateway to Open Resources and Projects at the University of Toronto. Under the broader Open UToronto umbrella, we have continued to leverage partnerships with both Coursera and EdX, responding to the interests and needs of our community and the evolving MOOC landscape. In collaboration with Alumni Relations, a special “Alumni MOOC” session was offered by Professor Steve Joordens in the fall of 2015. The Introduction to Psychology MOOC on the Coursera platform attracted 27,908 registrants in total, with 1814 or 6.5% of the total number signing up for the Alumni cohort experience. Feedback from participants indicated that our Alumni ranked themselves as having a high level of “intellectual connection with UofT” and over 90% indicated an interest in participating in future MOOCs. Notably, a high proportion of the participants in this pilot were female. We are planning a second Alumni MOOC offering in fall 2016, as BE101x: Behavioural Economics in Action will be offered on the EdX platform. The MOOC platform continues to provide a powerful opportunity for extending our reach to diverse learners beyond our campus borders. Demographic data collected through our partner platforms and research projects indicates learners have a range of educational backgrounds and differing motivations for participating in our courses. A total of 27 MOOCs are currently complete, active or pending. Our cumulative data on MOOC registrants, active participants, and completions are found in Appendix 1. 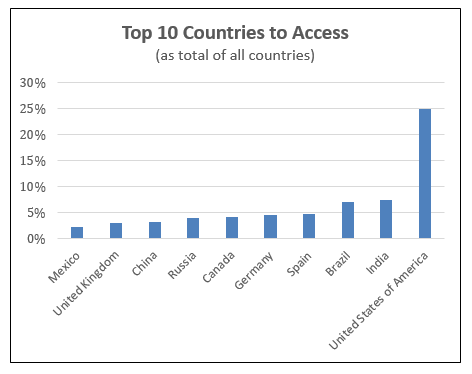 To date there have been over 1.6 million registrations, 800,000 users accessing archived MOOC courses and over 400,000 participants active in live courses. These learners are participating from locations around the world, notably with high levels of interest in Brazil and India. 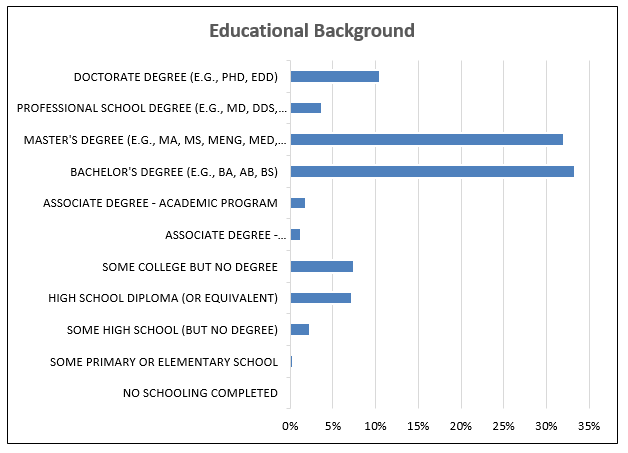 Demographic surveys indicate that many of the participants already have achieved a Bachelors or Masters degree. Other survey data collected shows that many are motivated by professional learning needs, opportunities for career advancement, and life-long learning experiences. As noted later in this report, our current research initiatives include exploration of the relationship between the self-reported intentions of the learners and their achievement in the MOOC courses. Last year, a team from OISE offered Teaching with Technology and Inquiry (INQ101x), an EdX MOOC designed for in-service teachers interested in learning how to integrate technology and inquiry into their own practice. The course was co-led by Professor Jim Slotta and Rosemary Evans, principal the University of Toronto School, and included a rich showcase of interviews and examples, as well as knowledge building activities to support authentic learning. 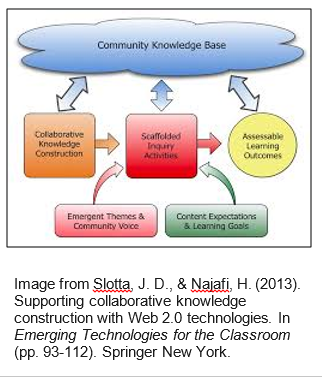 INQ101x applied Knowledge Community and Inquiry model (KCI; e.g., Slotta, & Najafi, 2013) in the MOOC context with more than 8000 registered participants. Participants created and applied a collection of annotated resources for teaching with technology and inquiry, and a subset of participants opted to collaboratively design a lesson plan, working in small groups and receiving feedback from the wider community. Two live events in the last week of the course allowed learners to discuss their questions with the course instructors and with master teachers who had contributed to INQ101x. During the course, 120 active design groups were formed. More than one thousand annotated resources were submitted to the resource collection. This MOOC provided a rich source of data for research undertaken over the past year, and was the basis for publications, conference presentations and a graduate thesis. Over the past year, two MOOC series have been offered in a self-paced format on a new Coursera “on-demand” platform. iOS Application Development is a four part certificate program that was funded through an advance from Coursera, and developed by a team of experts lead by Prof. Parham Arabi from the Faculty of Applied Science and Engineering. As well, Bioinformatics I and II comprise a two-part series developed by Prof. Nick Provart from Cell Systems Biology also delivered in this mode. Effective June 30, 2016, the on-demand model became the only supported platform for all Cousera MOOCS being offered. The Open UToronto team has been working with instructors who wish to migrate to the new model and several more of our MOOCS will become available on the new platform in fall 2016. The on-demand format supports rolling intake by cohort decreasing the pressure on the instruction team and improving the sustainability of the courses. Market research undertaken by our MOOC partners shows that many learners are interested in the possibility of following through a sequence of linked MOOC courses to achieve a credential. This has been demonstrated in the initial response to the iOS application development specialization and the Bioinformatics series described above. For example, the iOS certificate program is comprised of 3 courses plus a capstone project. Notably, the new iOS application specialization attracted over 100,000 visitors to the introductory description and had over 22,000 active learners who have completed some portion of the course. Bioinformatics I also had over 100,000 visitors and over 35,000 active learners. A third series on the topic of Faculty Development for Health Professions Teachers is being developed by a team from Medical Sciences, led by Dr. Marcus Law and Dr. Karen Leslie. Three of six short courses have already been developed and launched on the EdX platform, which offers a self-paced option on its main platform. The Open UToronto team supported a number of research studies over the past year, contributing significantly to the growing body of literature in this domain. We have bulit upon our previous work in the area of instructor experiences and design intentions, now moving into the area of learner motivation, intention and achievement in the on-demand format. We are among a few early leaders evaluating the student experience in self-paced MOOCs. 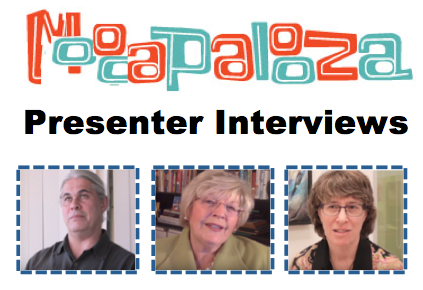 In an interview following our MOOCapalooza event, Dr. Carol Rolheiser, Director of the Centre for Teaching Support & Innovation, shared some thoughts on the influence of our work in this area. Our current study, under the leadership of Carol Rolheiser as Principle Investigator, looks at the significance of self-efficacy, task value and intention, in relation to achievement and help-seeking behaviours. This study is currently in the data collection phase, with findings to be share in the coming academic year. Najafi, H., Rolheiser, C., Harrison, L., & Håklev, S. (In press). Variations in the pedagogical design of Massive Open Online Courses across disciplines. Najafi, H., Rolheiser, C., Harrison, L., & Håklev, S. (In preparation). Learner motivation, intention, and achievement in on-demand courses. Najafi, H., Slotta, J., Haklev, S. (In preparation). Fostering reflective practice in a teacher professional development MOOC. 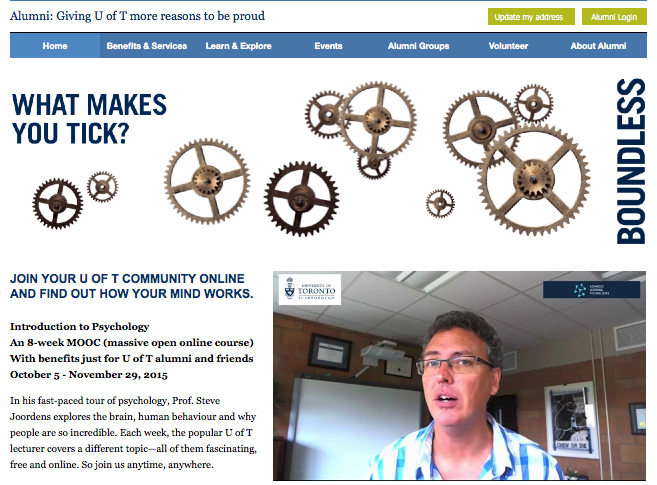 For a full listing of publications, poster and conference presentations see Open UToronto MOOC Research and Evaluation. Review our MOOC report on third year of activity. 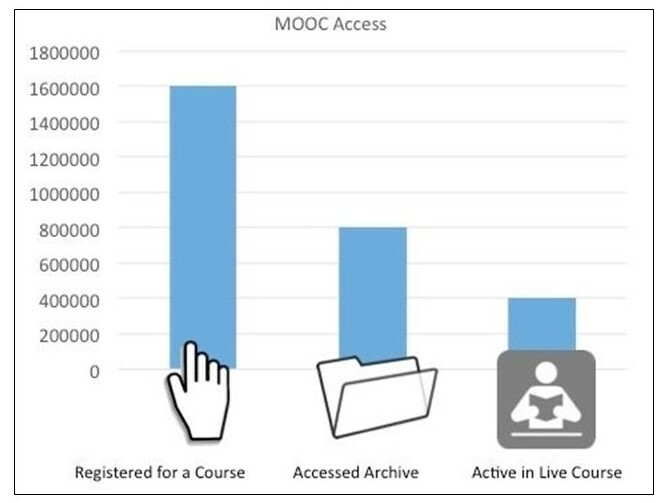 Data on participation in MOOCs available in archive mode up to point of sunset on June 30, 2016 is as follows. Both Coursera and EdX data on self-paced course activity are provided.